Here we go again. 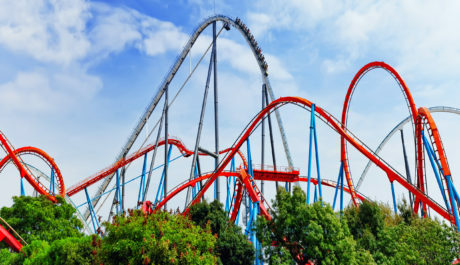 As we conclude a summer of excitement in the markets and our emotions ride that familiar roller coaster, we wait patiently for the Federal Reserve to determine the future of our investment portfolios. Or maybe it was China that had our fate in its hands, or was it Greece, or some other pending geopolitical situation? Frankly, it’s hard to keep track. It is true that volatility has been higher of late and that tends to happen in times of greater uncertainty. To be clear, it usually happens when there is potential uncertainty to the downside. As market participants grapple with the idea of rising rates, slowing China, and a general lack of growth in our domestic economy, our portfolios may seem like a kite twisting in the wind. Fortunately, none of this is new. We have seen times of greater volatility and greater uncertainty. Better still, there is a playbook for exactly this situation. For most investors, the ones who are interested in a long term solution to their investment needs, there are a series of steps that can not only alleviate the added stress of rocky markets, but can help turn what appears to be a disadvantage into a major opportunity. What do we mean by volatility anyway? Most investors have a general sense for this concept, but there are a few useful definitions. We can view volatility as the standard deviation of our portfolios or of any individual stock. For a set of observations, say the annual returns of stocks over the last 20 years, standard deviation gives us a feel for the annual variation from the average return. Average would be defined as the sum of all stock returns over that time divided by the number of years. Stock returns, being more volatile than those of bonds, would tend to deviate more from their long term average each year (up or down) while bond returns would deviate less in any given year. Using the options market we can get another description of volatility. The CBOE Volatility Index (VIX) is a gauge of 30-day forward-looking volatility as measured by S&P 500 index options. With the craziness that we have witnessed this year, we might have a tendency to think that we are in new territory, but the historical chart of the VIX would tell a different story. The latest readings, taken in a vacuum, feel like an ominous trend. In comparison to the last several cycles, however, they look very much normal. In fact, the summer of 2011 provided quite a bit more drama, at least in terms of the general fear factor as measured by the options market. Sometimes we get lulled into a sense of security, and we forget that market cycles just happen. The single most important thing that an investor can do is to let the portfolio work on its own, without a lot of direct interference. Your portfolio is probably quite adequate to weather a correction and bounce back strongly when the general population decides to take risk again. The single greatest 20-year period of stock returns started in early 1980 and ended at the top of the tech bubble in March 2000. The S&P 500 index returned 18.25% per year on average over that time. But in the midst of that, there were several negative years including one where the S&P 500 was down 4.9%. In the 20-year period between 1973 and 1992, the S&P 500 was up 11.3% on average, still an enviable run, but that period produced 5 down years including the 26.5% decline of 1974. There are plenty of things that an investor should be doing, but making knee jerk changes to the portfolio can only leave us confused and without a real plan. In the eye of the storm, when near term visibility is low, we need a reference point. We need a compass that can let us know our true direction even if we can’t see it at the moment. A financial plan is the perfect tool to help in this regard. It first identifies the short and long-term goals that the investor is trying to accomplish. Without those, there is no way to assess progress or where we are headed. Once the goals are in place and we know the size of our current assets, we can answer important questions like, how much risk should I take, how much should I be saving, when should I retire, etc… We can also figure out what rate of return is necessary to get us there which helps formulate the right asset allocation. In the depths of the 2008 Credit Crisis, investors who stayed committed to their plans found that the likelihood of attaining long-term goals was still very high, even when taking into account the lower asset levels. That is because when assets are allowed to compound over 10, 20, or even 30 years, today’s market movements don’t have nearly the impact you would think. The other important thing to note is that when major market segments have been devalued, their expected rates of return going forward actually go up, not down, as they are discounted. In financial terms, we would say that risk premiums (compensation for taking risk) are now higher. So it is critical to dust off the old financial plan, update the numbers and assumptions to reflect reality and see if we are still on track. Most investors will find that the ship is clearly still pointed in the right direction. The only way to truly manage risk is to maintain exposure to a number of global asset groups, This doesn’t mean just owning a handful of individual stocks, we need representation in large regions of the world asset markets. At a minimum, investors should have exposure to: U.S. stocks, non-U.S. stocks, emerging markets stocks, U.S. bonds, non-U.S. bonds, and preferably something not well correlated to any of these such as commodities or real estate. At times, some of these will perform well and some will not, but through the market cycle each of those groups should have an opportunity to be a solid performer in the portfolio. Those groups that seem to be out of style or out of favor will once again lead the way, and we will already be invested there without having to time the market or guess which area will outperform next. To achieve the exposure in step 3, we need to use well-diversified, low cost funds. Costs have a strong and inverse correlation with long term return when it comes to fund management. The higher the costs, the harder it is to achieve attractive returns over time. Index funds are a wonderful way to keep fees to a minimum and spread the investment dollars over hundreds, if not thousands, of different companies. These funds are designed to capture the returns of a broad index of assets, and you can create a global portfolio with them at an average cost of about 0.15% per year or less. These funds have become very popular with investors and easy to implement in portfolios. In the last 7 years, indexed domestic equity mutual funds and exchange traded funds have received over $1 trillion in net inflows while higher cost actively managed domestic equity mutual funds have seen net outflows of over $650 billion. Lastly, an investor must establish a disciplined rebalancing process. On a regular basis, it is necessarily to sell some of the winners and buy some of the losers. We know that each of these major asset groups will outperform at some point, we just don’t know when. In March of 2009, it was very difficult to sell bonds and buy stocks, but that was exactly the right thing to do. We recommend a time-based rebalancing that removes the tendency to guess where markets are headed, but allows us the opportunity to buy assets when they are low and sell them when they are higher. Patience is the greatest virtue that an investor can have. Success as an investor takes patience and time, but the benefits can be amazing. The 5-step process here is not a quick way to make money, or a magic formula for getting rich. It is sound and sensible solution that will allow investors to achieve market returns over their own investment life cycle. If you have implemented these 5 steps as part of your overall plan, then you can begin to see each market correction as an opportunity. You will know that your portfolio is prepared to handle the volatility, and you may even be enticed to buy more in a down market. Investing just became fun again!